The Fuji shut-off valve and piston design provides the benefit of stable shut-off and torque levels. The design ensures smooth movement of the piston which means oil pressure is transmitted precisely to the shut-off valve. In effect - both the accuracy and consistency of the tightening torque is improved greatly. For the low air pressure operation 0.4-0.5 MPa (4-5 bar), low pressure models (-L) are provided with special design optimizing oil flow from relief valve. Thanks to this design, even low oil pressure can be transmitted exactly to the shut-off valve. Plunger Mechanism provides the benefit of improved Torque Accuracy. For control of low torque, the oil pressure applied to the piston is maintained at a low level and improves torque control. To ensure high accuracy control of low torque, the plunger mechanism is utilised to deliver torque accurately. Oil leakage is prevented within the mechanism via a passage in the plunger which is designed to accommodate changes in oil pressure when the pulse is generated. Consequently, torque and tightening accuracy stability are maintained. To reduce effects on the environment and environmental energy during the life cycle of the tool, no paint is applied to the body of the tool. Consequently, the effect of paint peeling is eliminated. The full cover protector is designed as standard. Compared with conventional tools, weight is kept to a minimum. The grip handle size is optimised to provide enhanced levels of operator comfort. This special grip also absorbs vibration more effectively. Furthermore, reduced noise and vibration levels are standard with the FLT series due to the optimised dimensions. The 5412053116 Fuji FLT Series Shut-Off Type Pistol Pulse Wrench is one of thousands of quality tooling products available from MRO Tools. Please browse Fuji FL Series Shut-Off Type Pistol & Straight Model Pulse Wrenches, Sq. 6.35mm/9.5mm/12.7mm for tools similar to the 5412053116 Fuji FLT Series Shut-Off Type Pistol Pulse Wrench. 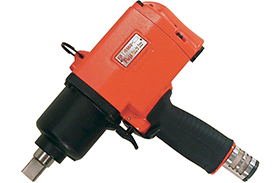 5412053116 Fuji FLT Series Shut-Off Type Pistol Pulse Wrench description summary: Model: FPT-110D Normal Type/Driver Bit Size: Long (-10) Type: Pistol Recommended Torque Range: 2-5N.m/1.5-3.7ft.lb Free Speed: 6,000 min-1 Square Drive Size/Bit Shank Size: Hex 6.35mm/Hex 1/4'' Quantity discounts may be available for the 5412053116 Fuji FLT Series Shut-Off Type Pistol Pulse Wrench. Please contact MRO Tools for details.